I've created this site so that we can talk. Please feel free to ask me any questions or leave any comments. I hope you enjoyed reading "There's an Ogre-Beast in the Playground"
Thanks for the message and questions. Glad you liked the story. I named the story "There's an Ogre-Beast in the Playground' because I felt the title would attract the attention of the reader. Sort of like a headline in a newspaper. I named the Ogre Biggens, but it sounds BIG! I named the School Red Apply Creek, because I wanted to use the analogy (big word) that everyone is like a red apply, and Henry feels like a green one. I put Chloe in Grade 5 so that I could connect to grade 5's reading the story. Hope I answered them all! My class just finshed reading " There's an Ogre-beast in the playground", and it was outstanding! it was really funny and it had alot of action; I did not read any of your books besides Ogre-beast, yet. But Ogre beast caught my attention. I can't make to read the other books you made. I love your story because I think they are intereting.I alos love chloe swan's name.Also I love when henry goes out and talk's to the oger-beast.I always loved chloe swan's name because I love swans and because there is a chloe in my class.I wouid change Bita to Emma because I like Emma better than Bita. Thanks for the email Rachel. Glad you liked it. I named the girl Bita because her name means "unique". I loved story! It was one oF the best storys I ever read. I think you should mack a few more chapters.My favouite charactere was biggens because he was really funny.I can not wait till you next story comes out.Hope ou read and injoy my leader.LOVED CHATTING WITH YOU. Thanks for the email. I'm making a sequel! Thanks for the email. Glad you liked it! Thanks Ethan. Glad you liked it. I have bin reading your nusepapper story thers a oger-beast in the playground at school.my favorit chapter was chapter7. I like chapter7 because you get to see the oger-beast and find out his name.My favorit caracter is henry because he is brave and diffrint. Thanks for your email Kyle!! I named the Ogre-Beast Biggens because he soooo big!! The original title to this story was "How Mr. Monster Biggens changed my Life." Thanks Emma. I'm glad you liked the story. I really like the book that you finished. There's an orge-beast in the playground.I like it. I really like when henry went to talk to the orge-beast to get to know him. I like when he made the video so that little girl would not be scared anymore too. Mr.francis will you make another book? My favourite part about the book was when the orge- beast said name is Biggins because he is a monster.You are a good aurther. Thanks for the email Alexis! The Ogre-Beasts are 100 feet high and live to be 300 years. I liked your story theres an orgre beast in the playground.My favourite part was when all of the kids on the black top came and sat with Henry.I have a few questions for u.Why did u make chloe swan in the 5th grade?Why was the little girls name Bita is that someones special name to u?Why was the boys name Farid?Why was Corban Barkley in 7th grade?Why did Biggens only appear in one chapter?The story is called theres an orgre beast in the playground.Thank u for reading my questions.Anyways my favourite charactor in the story was biggens he seemed nice & funny.Henry seemed like he had a bad year but he had a really cool year ,like I mean what other kid gets to talk to an orgre beast I know didn't.Oh ya & Henrys school is awesome they have ipads in the classroom oh I sure wish my class had ipads.If I could change anything I would put Biggens in more. Thanks for the email Julia!! dear mr. francis I like your story because it tells pepoll it is ok to be defrint.my fafrit carete is bigins because he is a oger and he sars leto lkids.you cod of cagd the end. "Hey!" The story "Theres an Ogre Beast in the playground" its interesting. "How did you come with this story?" The story is like Henry Horkiminder is really talking to us, its cool! "How many storys have you make?" I love your story beause it is super funny and good detail. "How did you think you should be an Author?" My favourite part is when Henry sneaked through the hallway when the police walked by and to see Chole Swan because he was like a "Secret Agent" My favourite character is Henry because he's nice and brave and also smart and to make everyone happy and save the day for everone at the school. Oh I almost forgot! Thank you for making the story come to live in my head! "Have a super fun and happy day!" See ya! Sup!My favourit part about the story is when herny shows the video of the ogre beast because Herny gets alot of hitson his video.How long it take you to make this awsome story.It is funny and cool also its not boring.Why did you name the the ogre beast biggens.Byee! I really liked the story Theres an ogre beast in the playground.One thing I would chanse would be to make that thear are two ogre beasts because it would be good one and a bad one.My favourit character was Biggens because he is nice. Thanks for the messages from your students. They ask really good questions! your book theres an ogre-beast on the playground was stunning. My favourite part was when Chloe Swan said that henry was cute. btw my name is Chloe. the ogre beast was enormus! how tall is he? I think that if i was a character in the story I would be like Henry, going out to talk to the ogre beast! !I think your story was the best ever because it had tonnnnnnnnnnnnnnnnnnnnnnnnnnnes of action! Drum role please! I think that you wrote the story very well. I would love it if you messaged me back! well hope i hear from you soon! Chloe - thanks for the email, and as requested, I'm messaging you back. The Ogre-Beasts are about 100 feet tall and can live to be about 300 years. Glad you liked the action. We just finished your story, The Ogre Beast in the Playground. The students in our 4/5 class at Mount Albion really enjoyed it. Soon they hope to send you their thoughts about the story and how meaningful it is to them. Great. Thanks for the message. I'm looking forward to hearing from them. I really enjoyed There’s an Ogre Beast in the playground! I liked it because it has humour, meaning and a happy ending. I also liked that Henry found his place in Apple Creek! Now we have a few questions for you! Why did you leave the readers hanging instead of telling them what happens next? 2 How did you come up with all these awesome names?! 3 Why did you put an ogre beast in the story? Please write back soon. P.S. What we meant by the meaning is that we got the message of bullying in your story!!!!!! Jakub and I (Daniel) we wanted to tell you that we liked your book! (There is an ogre beast in the playground) Also we didn’t just want to say we liked it we also wanted to ask you some questions! So the first question Jakub and I came up with is … why did you leave all the readers that read this book hanging without knowing the secrets? (And what I mean by that is when Henry sucked up the pedals of the flowers from chapter 10.) 2nd question… if you were you to make chapter 11, what would it be about? If the type of story was swapped so Henry swapped places with Corban, what would it be like? 5th question… why did you make the book like this was this /was it something that happened in your life/school? P.S. Sorry if you have to write lots back to us we just wanted to know many different things about the story. Our names are Steven and Alexander. We are in Mr. Craig’s class. We loved your book the ogre-beast and the playground! My favourite part is when the police were shooting nuts at Biggens!!!!!!!!!!! –Steven. Your book was very enjoyable Mr. Francis! My favourite part was when Henry went out to talk to the Ogre-beast. He was so brave! The Ogre-beast could have eaten him at any second! –Alexander. Now for our questions. 1) If there was a chapter 11 what would it be about? 2) If Corban hadn’t been so mean to Henry what would the story be about? 3) If there was an additional story to “The Ogre-beast and the playground” what would it be about? 4) If it was reversed and Henry was the one being Corban what would it be like? We really enjoyed reading the ogre-beast in the playground! Our favourite part is when the little boy said, “call the army and get them to blow it up”! Our favourite character is Henry and Biggens. Also, we have a few questions. 1 Did this story actually happen? 2 If you had to make a book 2 what would happen? 3 Did you make this book because you were bullied when you were a kid? 4 Why did you call the book There’s An Ogre Beast in the Playground? Thanks for your patience reading this!! P.S We think you should make a book 2!!! My name is Liam and my friend Nathan and I liked the book There’s An Ogre-Beast in the Playground. Nathan’s favourite part was when Henry talked to the ogre-beast. Mine was when Biggens was getting shot at with peanuts. We didn’t really understand the ending of chapter 10. Is Henry an ogre-beast or is he related to the ogre-beast or… u want every chapter to end with a mystery? And when Henry goes to school it seems like he stays in there for 12 month’s or something. Well, any ways we really like the book please make a part 2. Your story was great! We liked the part when Henry talked to Biggens. Here are our questions. 1) Why did you end the story with a mystery? 2) If you made another book based on the ogre beast what would happen in it? 3) Why did you name the school Red Apple Creek? 4) Why did you end the story at chapter 10? Thank you for listening! 1)Why do you make books? 2)What inspires you to make books? 3) How many books have you made? We really liked your story “The Ogre-Beast in the Playground”. Our favourite character is Biggens. He is so cute. We also have a few questions. 1. Why did you make Biggens an Ogre-beast? 2. Why did you end the story the way you did? 3. How old is Biggens? 4. Why does the principal smell like peanut butter? Our last question is why is Henry so tall? That is all our questions, thank you for reading our post. Our names are Sarah and Thomas, we are in Mr. Craig’s class. We love you story ogre- beast and the playground. Now we have some questions for you. Why is the ogre-beast named Biggens and why is he allergic to peanuts ? Why is a grade 4 named Henry Horkinminder 6’foot 6? Next to the teachers how did you come up with their names EX: Miss. Fetherly, Mr. Furry. Have you ever considered renaming your teachers? Like Mr. Craig or Madame. Is the prince able always covered in peanut butter because he wants Biggens to leave him alone? If not can you tell me why? If had to make a chapter 11 what would it be about? Why did you end the story the way you did? If you want to change anything what would it be? We Just finished all 10 Chapters of Theres a Ogre Beast in the Playground. We like it very very much. Our favourite part is when the police were shooting nuts at Biggens. We envisioned it would be very funny. Now we are going to ask you some questions. 1. Why did you end the story like that? 2. Can you describe what chapter 11 would be like? 3. We love There’s an Ogre Beast in the Playground. Hi. I’m David and I liked the part when the teacher sneezed all over Henry! Hi. I’m Logan and I like when Biggens made a message on the ipad. Now here are questions 1st question: Why did you end the story like this? 2nd question: Will u make a book 2 to continue the story?3rd question: Why did you name the ogre beast Biggens? Corban Barkley because in every chapter Henry learns more and more. In the last chapter why did you pick that interesting ending? If you didn’t what would you have written? If you wrote a chapter 11 what will it be about? Our names are Daaim and Aidan. We just read your book. We love your book. (It was THERES AN OGRE BEAST IN THE PLAYGROUND). Our favourite part was when the kinder garten said “Call the army get them to blow up the ogre beast!” It was really funny!!! 1. Why did you choose the ending you chose? 2. Will you make a sequel? 3. How did you get the inspiration for the book? 4. Will you come to our school if you tell us your email we will email you back??? Daaim & Aidan From B Craig’s 4/5 class!!!! We all love your story . How come the story ended with a mystery ? But I still like it. Jennifer and I have a questions. If you made an 11 th chapter what would it be about? We have another question: Why did you name the oger beast Biggens and why did you make biggens nice and not mad like all the other ogres? Hi Mr. Craig's class. Thanks for all the messages. I'll try my best to reply to all of you in this email. Hope that's okay. Mr. Craig - thanks for giving your students the opportunity to email me. Alex and Vanessa - Glad you liked the story. I was hoping the readers would be left wondering why Henry sucked the petals up his nose at the end of the story. What do you think that means? Jakub and Daniel - Hi, thanks for the email. Did you figure out what Henry's secret was? If he sucked petals up his nose, what does that mean? Do you think he's an Ogre-Beast as well? Alexander and Steven - If there was a Chapter 11, it would be about how Henry's life had changed at Red Apple Creek and how his friendships develop. Jason and Kenya - I am making a book 2. Right now it's called "The Whispering Tree". Not sure if that will be the title when I'm finished though. Nathan and Liam - Henry is a half Ogre-Beast. It gets explained in the second book. I named the school Red Apple Creek to highlight the analogy I used with green and red. Marisa, Rachel and Daniel - I ended the story with Chapter 10 because I wanted to leave the readers satisfied that Henry saved the school and was a hero, but also leaving them curious to know more about Henry. Kayleigh and Maddy - I made Biggens an Ogre-Beast because I wanted the reader to think of a creature that was 'different' than most creatures. This would help emphasize the point in the story about being different and how Henry can relate to Biggens. Sarah and Thomas - Henry is so tall because he's actually half an Ogre-Beast. Biggens is Allergic to peanuts because all Ogre-Beasts are. Chelsey and Lily - Glad you liked the story - I hope your questions will be answered from my other replies. David and Logan - Thanks for the email and nope, this isn't a true story. I named the Ogre-Beast Biggens because he's so big! Kayleigh and Maddy - Biggens is about 80 years old and Henry is so tall because he's part Ogre! Hope I answered everyone's questions! Biggens is about 100 feet tall and is about 80 years old. We looked forward to each new chapter of There's an Ogre- Beast in the Playground. We really liked the illustrations of the Ogre- Beast. We were excited to see what was going to happen with Henry, the Ogre- Beast and Corban Barkley. The important lessons we learned from the story are don't judge a book by it's cover. We should not judge Henry (for his hair colour and size) or Biggens (for his size and looks). We also learned that the stories about Biggens were not true. It is important not to spread rumours and gossip. Most importantly we learned that it is okay to be different. We also have alot of questions for you! 1. Will you be writing another story with the same characters or will you add new characters? 2. How old is Biggens? 3. Did you ever feel like a green apple in a red apple school? Hi Samuel, Payton, Nathan, Remi, Matthew, Logan, Mr. Boyer and Mrs. Wierts. Thanks for the message. I'm glad you enjoyed the story and learned some key lessons, especially that being different is okay, and we need to accept and embrace differences. 1. Will you be writing another story with the same characters or will you add new characters? I am in the middle of writing the sequel and it will hopefully be out in the fall. 2. How old is Biggens? Mr. Biggens is over a hundred years old. In the sequel you will meet some of his relatives. 3. Did you ever feel like a green apple in a red apple school? At times I have felt like a green apple in a red apple school, and it took experience, and important conversations with role models to help guide me through some of the difficult times (and ultimately accepting those green moments as great moments). 4. Were you ever bullied? I was never bullied, but being a teacher I see it all the time. 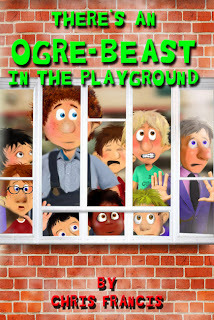 My Grade 4 students read "There's an Ogre Beast in the Playground," and really enjoyed it. They couldn't wait for each chapter to arrive. They will be writing to you soon! We also have recently finished reading, "There's an Ogre Beast in the Playground". My grade three students enjoyed reading each chapter as they arrived in the newspaper and we had some very interesting discussions. I read in one of the earlier posts that you are writing a sequel, and when I told my students that, they got very excited! We can't wait. My friends are in the process of writing you a letter and we will be posting them soon. Hello my name is Tiana and I am in Mrs.Driscolls class and we read There's an Ogre Beast in the Playground and I really like how you ended the story and I think the moral of the story is its okay to be different and I hope in future years I get to read more of your books! Hi my name is Liam and I am in Mrs. Driscoll's class and we read There's an Ogre in the Playground. I really like your illustrations. Also my favorite part was when Henry sucked the flower pedals to mock the Ogre. I really enjoyed your book and I hope we read another one in class. Thank you. I was wondering why didn't you write that Henry gave the flower to Chloe Swan. Otherwise I loved the book and the book was very nice. Who was Madelyn Mayfeather really? I'm a intermediate/middle-grade teacher with a passion for writing and illustrating children's books.